Imagine that you work for Tecmo. 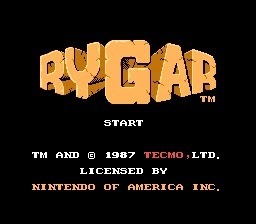 Your team has made an arcade game called Rygar. It’s OK, I guess. It’s really repetitive. The main character, Rygar, basically moves from left to right, jumps over barriers and hits enemies while picking up powerups. That’s all you do throughout the entire arcade game, and it doesn’t exactly set the world on fire. It’s time to port this game to the NES. You’ve got two choices: Port the arcade game exactly as it is and hope for the best, or maybe, just maybe, try something a little different. How different? Well, someone on your team has got a crazy idea: What if you copied some of the ideas from the game, except Rygar got experience points for killing enemies, and Rygar could pick up different powers throughout the game, which would open up new areas? Wouldn’t that be neat? If that description sounds a little familiar, that’s because it’s what we call today a “Metroidvania” game. “Metroidvania” is a portmanteau of the two prime examples of this time of game, Metroid and modern Castlevania games. Most people view Metroid as the first example of this style, but did you notice that we haven’t discussed Metroid yet? That’s because Rygar for the NES beat it to market by a month. Yes, Rygar was Metroid before Metroid was Metroid. We’ll take a closer look at Metroid shortly, but since it’s far more well known, we’ll have to use it as a point of reference for some things. For example, Metroid was far more deliberate than Rygar. Rygar is about forward movement and killing enemies. Like, a lot of enemies. They spawn relentlessly, and to get stronger, you’re going to have to spend some time standing around and slaughtering a few piles of them, otherwise known as grinding. Now, we criticized some previous games, like Kid Icarus, for being a bit of a grind. How is Rygar any different? Well, unlike Kid Icarus, there are tangible results for your grinding. On the pause screen, there’s a clear number that goes up, showing your defense and attack number. The more enemies you kill, the higher that number goes. The higher the number, the stronger you are, and the less attacks it takes to kill an enemy. Since your attacks are swift and deadly, this character growth happens quickly, so you don’t mind stopping for a minute or two to kill things. There are immediate, tangible and satisfying rewards for grinding. The special weapons make a big difference too. Other games had special weapons too, but in Rygar, there are certain areas that you simply can’t get to unless you’ve found a special weapon first. For example, the grappling hook can reach areas above or below the screen safely, the pulley can traverse gaps that you couldn’t normally reach by jumping, and so on. They’re usually not hard to find, but this mere idea was groundbreaking, even more so when you consider that Rygar was built on the foundation of so-so arcade game. Now, Rygar is definitely a very primitive Metroidvania. 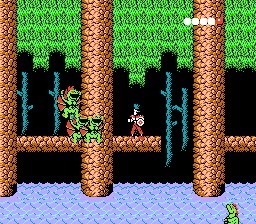 Sometimes in Rygar, the screen will fill with so many enemies that the music slows down. The music can be a little annoying at times, almost like it veers wildly from bombastic and awesome to lackluster. Also, left over from the arcade game, there are several sections that are merely “walk from left to right” affairs, and that gets a little annoying. Finally, for better or worse, there’s very little backtracking, or going back to open up old areas with new weapons. I happen to like backtracking in my Metroidvanias. Some people don’t. C’est la vie. Still, Rygar is really fun. It showed that you didn’t have to copy an arcade game verbatim in order to port it to a home console, and you were usually better off if you didn’t try. A console game was a completely different animal than an arcade game and needed to be treated like it. Rygar was a great place to start. Want more NES games? Click here for more NES Replay!